HD 219134, nestled between Cassiopeia and Cephus, is remarkable in so many ways. It was first studied with HARPS-N, during it’s Rocky Planet Search. This instrument, a spectrograph on the TNG telescope in the Canary Islands, is able to measure the motion of stars so precisely that it can spot the to-and-fro wobble caused by planets. Amazingly, this instrument found not just one but four planets around this star; a mini solar system just like our own. The outermost is a gas giant on a 3-year orbit, while the inner three are between the size of Earth and Neptune orbiting once every 3, 7 and 47 days. At this point, astronomers had no idea if these new worlds transited. But a planet on a 3-day orbit has pretty good odds to pass in front of its star so, taking control of the Spitzer space telescope, they pointed it and hoped. And sure enough, exactly when predicted, the innermost planet blocked out 0.036% of starlight. This fraction is just the surface area of the star covered up, giving a precise measure of the radius of the planet. Now, with the mass of the planet measured by HARPS and the radius of the planet measured by Spitzer, it’s density can be found. While many similar sized worlds have turned out to be fluffy gas-balls rather than true super-Earths, a density of 5.89gcm-3 puts HD 219134b bang on Earth-like composition. If there was a surface, it’s gravity would be just under twice what we experience on Earth (18.8ms-3). 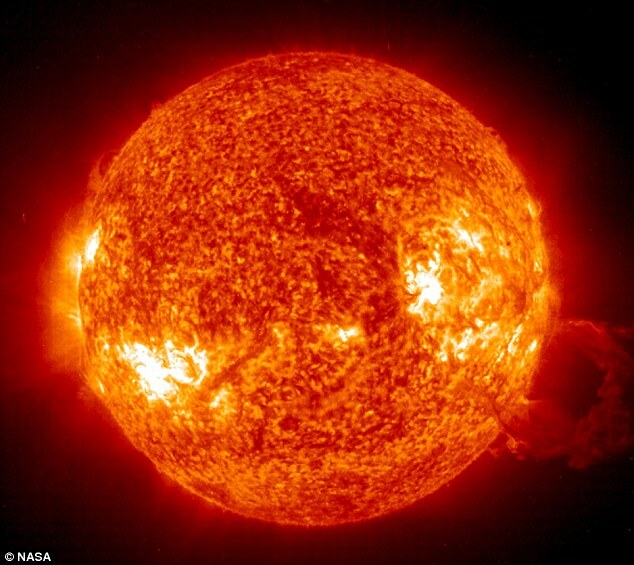 With an orbit of only three days, though, the planet’s star-facing surface is likely to be hot enough to melt! 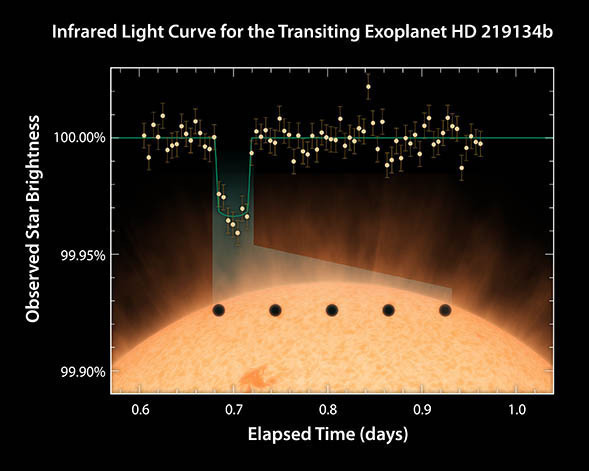 At only 20 light years away, the newly-discovered solar system around HD219134 is also the closest transiting exoplanet ever found, and one of the 20 closest bright star systems to our Sun. With transiting planets extremely rare, there’s even a chance that this could actually be the closest transiting planet around a bright star (K & G-type). HD219134’s brightness is also important for astronomers. The brighter & closer a planet, the more interesting ways we can study it. For example, this new world has jumped to the top of the list for those trying to study exoplanet atmospheres. We can also measure the path it takes as it crosses it’s star to determine just how the planet orbits. The outer 3 planets might peturb the orbits of the inner one, causing detectable variations in transit timing (TTVs). Elizabeth Tasker’s piece on “The closest rocky planet ever has been found… so what? If, in 2009, you asked 18-year-old me to name an exoplanet, then Gliese 581d would have been it. Discovered by an American team of astronomers in 2007, it was, for a long time, the poster child for exoplanetary science. Not only was the first rocky world ever found in the habitable zone of its star where life-friendly temperatures are found, it was also relatively nearby (for astronomy standards) at only 20 light years. Astronomers used the radial velocity technique to find the first planet around Gliese 581 as far back as 2005. This method relies on the gravitational pull that a planet has on a star as it orbits. This wobble is detectable in the spectra of the starlight, which gets doppler shifted as the star moves back-and-forth, allowing the period and mass of an orbiting planet to be determined. While the first planet, ‘b’, orbited close to the star with a period of only 5.4 days, it was joined by two cooler (and more habitable) planets, ‘c’ and ‘d’ in 2007. This was soon followed in 2009 by Gliese 581e, the smallest planet in the system on an even shorter (3.1d) orbit. Things started to get even more confusing in 2010 when observers at the Keck observatory announced two more planets (‘f’ and ‘g’) orbiting at 433 and 37 days respectively. This would put ‘g’ between ‘c’ and ‘d’ and right in the middle of the star’s habitable zone. However, new observations of the star with a Swiss telescope showed no such signal. Was there a problem with the data, or could something else be mimicking these planets? One problem comes when we consider the star itself. Just like our own sun, most stars are active, with starspots skimming across the surface and convection currents in the photosphere causing noise in our measurements. These active regions can often mimic a planet, suppressing the light from one side of the rotating star and shifting the spectra as if the star itself were moving back-and-forth. Add to that the fact that, like planets, activity comes and goes on regular timescales and that cool stars such as Gliese 581 are even more dynamic than our pot-marked sun, and the problem becomes apparent. The first planet to bite the interstellar dust was ‘f’. At 433 days, its orbit closely matches an alias of the star’s 4.5-year activity cycle, and it was quickly retracted in 2010. Similar analyses with more data also suggested Gliese 581g was also likely to be an imposter, but the original team stuck by this discovery. For the last 3 years, this controversy has simmered, until last month all the data available for Glises-581 was re-analysed by Paul Robertson at Penn State. This showed that not only is Gliese 581g not a planet, but that the poster child itself, Gliese 581d, was also an imposter. The signal strength of any potential planets with (red) and without (blue) activity correction. To do this, the team took all 239 spectra of GJ581 and analysed not just the apparent shift in velocity, but the atomic absorption lines themselves. Using the strength of the Hα absorption line as an indicator for the star’s activity, they compared this to the residual radial velocity (after removing the signal from planet b). This showed that there was a relatively strong correlation between activity and RV, especially over three observing seasons when the star was in a more active phase. They also found that this activity indicator varied on a 130 day timescale. When the team removed the signal from stellar activity, they found that planets ‘c’ and ‘e’ were even more obvious than in previous searches. However the signal for planet ‘d’ dropped by more than 60%, way below the threshold needed to confirm a planet. Even more remarkably, ‘g’ does not appear at all. So what exactly caused this ghostly signal. The planet’s orbital period of 66 days gives us a clue -it is almost exactly half that of the star’s 130 day rotation cycle, so with a few fleeting starspots and the right orientation, a strong planet-like signal at 66 days results. This case of mistaken identity is a sad one, but thanks to the incredible progress of our field in the last 5 years, their loss barely makes a dent in the number of potentially habitable exoplanets known. Instead, it acts as a warning for planet-hunters: sometimes not all that glitters is gold. A Planet for Every Star? Astronomers have now found an astonishing 1000 exoplanets. But that pales in comparison to the 100 billion stars in our galaxy. So how can we say whether planets are the norm? And is it possible to find a star that is definitively a planet-free zone? The current crop of alien worlds comes from a limited selection of well-studied stars. Rather than try to directly spot what is the equivalent of a fleck of dust in a spotlight, astronomers use changes in the light of the star itself to tease out the signal of a planetary companion. This can be done in a variety of ways, each of them with their own shortcomings. Often the method of discovery itself means that only a tiny selection of flukily-aligned planets will have the potential of being discovered. For example, the Kepler spacecraft was staring at over 100,000 stars to try to detect the drop in light as exoplanets crossed their star. However, the probability of the average planet making this crossing is extraordinarily low. A planet orbiting at 1AU (the same distance from its star as Earth) will be found in only 1 in 200 such systems! To put that in perspective; for each Earth-like planet found by Kepler, 199 more stars with planets exactly like our own will have been be tossed aside. The other common detection technique, known as radial velocity, is marginally less wasteful. This uses the to-and-fro of the star imprinted in the colour variations (or spectra) to find the delicate gravitational tug of a planet. While this works for planets in most orbits, if they happen to circle their star in a face-on orientation, no signal will be received at all. For both cases, this means that even if no planetary signal is detected at all, we can’t definitively say there isn’t one there. These techniques are also only sensitive to planets larger than a certain size. While the Kepler mission was able to find Earth-sized worlds, similar transit surveys from the ground will only ever be able to find large Gas Giants. Any Mars or Mercury-sized planets will be missed entirely. Radial Velocity is also limited by size, with Neptune or Super-Earth-sized worlds the current limit. These searches are both also bias towards planets close to their stars. To detect worlds at Earth distances is a much trickier prospect than those scraping the surface of their stars. So many planets will be missed entirely. How can we talk with any certainty about the number of planets in the whole Galaxy? Well, because the exact problems with these techniques are known, astronomers can estimate how many planets we expect to find. If we know the number of stars studied and the probability of an orbit being perfectly aligned, we can use the number of planets found to estimate the number of planets around all stars. For example, a study of gravitational lensing by planets showed that on average every star has a planet larger than 5 Earth Masses from 0.5 to 10AU. Similar studies have also been done with Kepler, finding basically the same number: More than one planet bigger than Earth from 0 to 2AU around every star. It should also be noted that these results also only cover a tiny portion of potential planets. Distant Jupiters or low-mass rocky planets were missed completely. So, as our searches become more and more sensitive to small and distant worlds, those numbers can only go up. It’s likely that on average every star in the Milky Way has its own Solar System with multiple planets. But what about lonely, planet-less worlds? There are certain to be stars without any planetary material wandering the cosmos. For example, those dislodged from triple-star systems, as can happen due to gravitational resonance and scattering, might not hold onto any planetary material. But until we’re able to study a star in perfect detail and definitively say no planets exist, we are forced to stick with what has become the default setting: all stars have planets, and it’s just a matter of time until we find them.